If you are exhausted by transferring data from Vertica to Magento 2, you’ve come to the right place. Below, we describe a tiny tool designed to automate this process. If you are looking for how to establish the Magento 2 Vertica integration – also welcome! The following article describes a universal approach suitable for all remote databases and compares it to the more efficient one. We know how to import data from Vertica to Magento 2 and would like to share this knowledge with you. The common approach of moving Vertica tables into Magento 2 is based on three pillars. First of all, you need to create a CSV output since it is the only data format suitable for the Magento import. Next, it is necessary to edit the generated file making it ready for the import process. Finally, you can transfer the desired data into Magento 2. Let’s describe each step in more detail. vsql -U dbadmin -F ',' -A -P footer=off -o dumpfile.txt -c "select ... from ... where ...;"
For further information, follow this link: Exporting Data Using vsql. Now, you should adopt the content of the CSV file to the Magento 2 requirements. Since different systems always have their demands regarding the way data is represented within, it is impossible to import information from one platform to another directly. You should still work with attributes and sometimes their values. And while different values don’t block the import process, unrelated attributes cause errors. That’s why you should take the output CSV file from the previous step and review its content. The more attributes you have – the more work should be done. As for values, we recommend editing them as well in case your database doesn’t contain the same designations. Thus, you will keep your catalog in order. Otherwise, it would be necessary to fix problems from the admin section which is even more time-consuming. Now, when all third-party attributes and their values are matched to the ones used in Magento 2, it is possible to run the import process. The default Magento 2 tools are enough to complete this goal, but they will never automate the procedure. Consequently, you have to repeat the steps above every time an update is required. Check the following guide to discover proper Magento 2 attributes and other nuances of the successful import process: The Complete Guide to Magento 2 Product Import / Export. So, what are the pros and cons of the traditional approach to data import from Vertica to Magento 2? Let’s see. Magento 2 Vertica data import. The only positive aspect here is the ability to complete the import process. The default procedure is far from being user-friendly, but you can apply the same logic to every integration. But there are too many drawbacks. You must admit that these reasons are enough to look for a more user-friendly way of importing data from Vertica to Magento 2, and below we’ve prepared one. It is not a surprise that the improved way of moving data from Vertica to Magento 2 is based on a third-party extension, so meet the Improved Import & Export module. This tool is designed to simplify your integration with the database as well as enhance all import and export processes. The extension has lots of useful features, but let’s take a look at the improved method of importing Vertica bases into Magento 2 first. Instead of creating, editing, and transferring CSV files, you can connect to Vertica directly with the Improved Import & Export Magento 2 extension. Our module provides the ability to establish a data bridge between your e-commerce website and the database where all the necessary updates are effortlessly transferred from one point to another. The new way of connection has several unique features. Since the Magento 2 Vertica data import is no longer based on data files, you eliminate the two first steps of the default procedure. The Improved Import & Export Magento 2 extension provides the ability to eradicate both complicated CSV export process and time-consuming attributes matching. Furthermore, you can automate data transfers entirely. There are two ways of doing so. Firstly, the module lets you create a schedule of updates. Secondly, you can specify event-based triggers. Both features are described further in this post. But direct data transfers don’t solve the problem of different attribute standards. Therefore, you still have to match them. Luckily, the Improved Import & Export Magento 2 extension provides several robust tools that revamp entirely the procedure described above. For attributes, you can use mapping presets or an intuitive matching interface. As for their values, they can also be mapped or edited in bulk. We will describe all these features soon. Now, let’s take a look at the improved data import from Vertica into Magento 2. Go to the Magento admin, find the Improved Import & Export extension, open its import section, and create a new job (profile) there. Save and launch the profile. That’s it! These small steps are necessary to replace the complicated standard way of moving data from a remote database into Magento 2. The Improved Import & Export extension helps to save tons of time and effort connecting your e-commerce store to Vertica. And note that the process is fully automated, so you prevent further time expenditures! Let’s see what pros and cons the Improved Import & Export offers then it comes to the Magento 2 Vertica integration. What are the cons, you will ask? The only negative aspect is the necessity to install a third-party module. How do we fix it? With the help of our friendly support. Contact us in case of any difficulties, and the Firebear team will help you solve the problem. Don’t forget that you can propose your particular changes to the module’s functionality. We will discuss their implementation with pleasure! Thus, the installation of the Improved Import & Export extension is a necessity if you want to import data from Vertica to Magento 2 without any headaches in a more efficient way. Now, let’s take a look at the features of the database and then proceed to a more in-depth exploration of our module. Being simultaneously a relational DBMS, document store, and key-value store, Vertica is often compared with Cassandra, Amazon Redshift, and Oracle. Its specific characteristics include Columnar storage, MPP, Hybrid storage model, Aggressive data compression, High availability, ANSI SQL, etc. It is available both as a cloud and on-premise solution. Cost-based and subscription-based models are available. 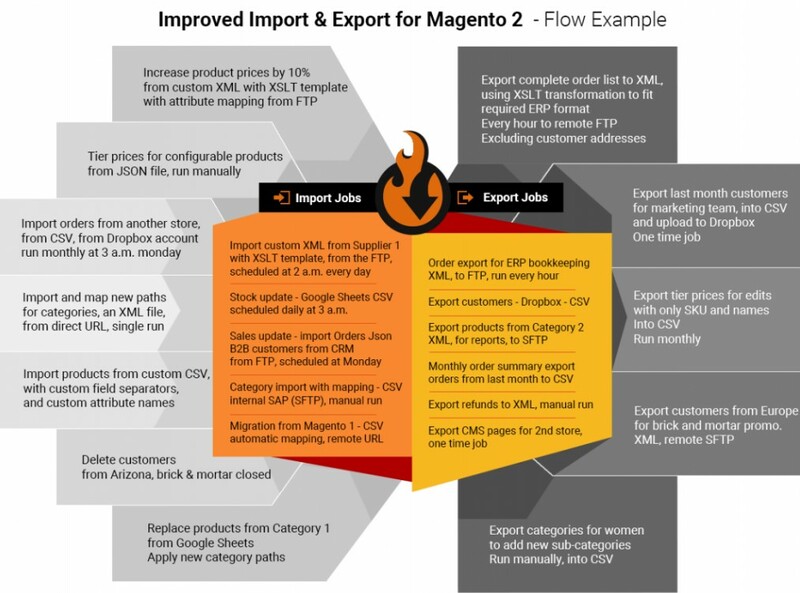 Below, we describe the Improved Import & Export Magento 2 extension and shed light on its automation, mapping, and connectivity features. As mentioned above, our module provides two ways of making every connection entirely automated. You can either create a schedule or specify events that will be considered triggers. The Improved Import & Export Magento 2 extension supports cron allowing you to create a custom schedule of updates. Use the standard cron syntax to specify any period that suits your business needs. At the same time, the module enables you to select one of the predefined intervals which are fully customizable as well. If necessary, you can create a profile that has no schedule. Use it for one-time migrations or asynchronous updates. And don’t forget that the ability to launch import or export processes is available for scheduled profiles as well. In addition to schedules, you can specify what system processes or custom events can launch updates. Furthermore, the Improved Import & Export Magento 2 extension lets you specify various conditions to run data transfers more precisely. For further information, follow this link: How to Run Magento 2 Import or Export After Specific System Event or Process. The following section of this article explores features designed to improve your interaction with attributes. Several ways of attributes mapping and their values editing are discussed below. The ability to match external attributes to ones used internally is dramatically simplified with the help of mapping presets. The Improved Import & Export extension provides a list of predefined mapping schemes that can be applied in a few clicks. Thus, you don’t need to match external designations to ones used internally in a manual mode. Just click a few buttons, and our module will analyze the input data making it suitable for the import process. Besides, it is possible to match attribute values in a more efficient way. You no longer need to edit files to achieve this goal. The Improved Import & Export Magento 2 extension provides the ability to specify an external attribute value and match it to the corresponding internal one just like we’ve performed above with attributes. Since attribute values vary a lot depending on each business, there are no presets, but manual matching within a user-friendly environment won’t take much time. Follow this link for further information: Attribute Values Mapping. In addition to the feature above, we also provide the ability to edit attribute values in bulk. You can use one or multiple commands simultaneously to implement changes. Furthermore, our extension provides the ability to create specific conditions to change attribute values more precisely. You can either add a prefix or suffix. At the same time, Improved Import & Export provides the ability to split and merge data depending on the condition of values. Sometimes, multiple values can be combined. If they are separated, it is not a problem as well. The ability to edit attribute values is described in this article: How to Modify Attribute Values During Import and Export in Magento 2. And you can create categories on the fly. It is also a straightforward procedure. Specify a parent category and type a name of a new one. For further information, follow this link: Category Mapping. The full algorithm is described here: Product attributes import. 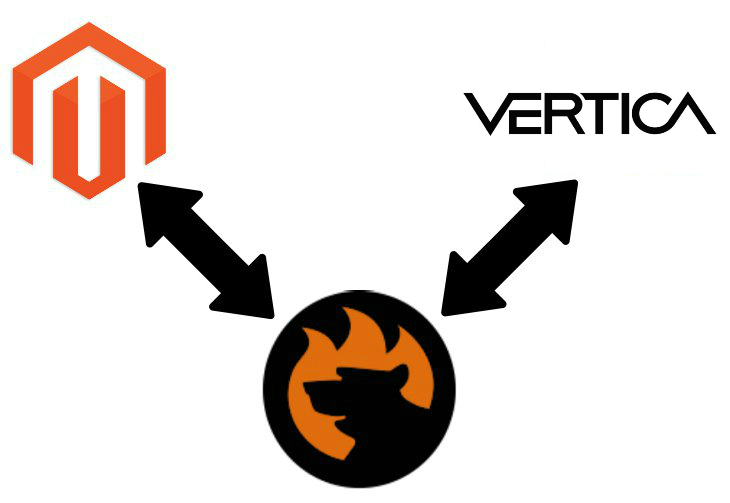 While the Magento 2 Vertica integration is based on a direct connection, there are several more ways to synchronize the data flow between Magento 2 and external platforms. You can use file transfers or rely on intermediaries. While Magento works with CSV files only, the Improved Import & Export Magento 2 extension dramatically extends the default functionality of the platform. It provides the ability to import/export data via XML, JSON, ODS, and Excel. Consequently, you no longer need to convert files of this formats into CSV and back. To transfer data files seamlessly, the Improved Import & Export module support numerous sources. 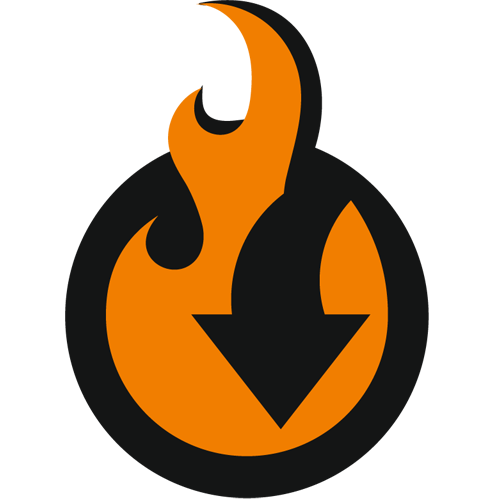 The extension supports the FTP/SFTP connection. It means that you can move files using a local or remote server. A Dropbox account can be utilized for the same purpose. And if you deal with import processes only, it is possible to specify a direct URL. Note that all compressed files are unzipped/untarred automatically. Secondly, the module allows establishing the direct API connection. You can freely use REST, SOAP, and GraphQL integrations to synchronize the Magento 2 store with an external system.